Located on Bulgaria blvd, in the very centre of Veliko Tarnovo, the property occupies a prominent trading location in a densely populated residential area with a bus stop opposite. Bulgaria blvd is one of the main roads in Veliko Tarnovo and is extremely busy with a high number of vehicles. The shop spreads on two levels and has 95 sq.m. area. 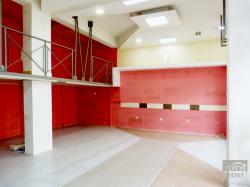 The first level consists of one spacious commercial premise, a storage and a toilet. Upstairs you can find another storage with one more commercial area as a terrace. There are laminate and tiled flooring, latex-painted walls, aluminum window frames and doors. The store has a large window display. The place has high business potential because of its location and would suit a number of different business.